It was goals galore as Manchester City maintained their place at the summit of the Premier League with a demolition job of new boys Bournemouth. Manchester United beat Everton at Goodison Park with Wayne Rooney getting on the scoresheet against his former club. The weekend’s worth of football also saw Jurgen Klopp oversee his first game in charge of Liverpool against Tottenham at White Hart Lane. But who makes it into this week’s team of the week? Mignolet gets the nod betwee the sticks after performing admirably in Klopp’s first game. Mignolet was exceptional throughout the game and made a world-class save to deny Clinton N’Jie in the first half as well as stopping Harry Kane in a one-on-one situation. He was brilliant throughout the game and ensured a clean sheet for his new manager and earned Liverpool a point. French full-back Mathieu Debuchy might have to settle for a place on the bench again as Spaniard Hector Bellerin shows no sign of his good run of form coming to an end. Another energetic performance against Watford where Bellerin bailed out Per Mertesacker numerous times was capped with a fine assist for Aaron Ramsey’s goal in the 3-0 win at Vicarage Road. Southampton manager Ronald Koeman described Virgil Van Dijk’s debut against West Brom two weeks ago as ‘perfect’. However, the Dutchman may want to re-consider his choice of words as Van Dijk excelled in the Saints’ 3-1 win over Swansea. The £11.5m summer signing from Celtic opened the scoring after a James Ward-Prowse corner and forced Lukasz Fabianski into a very smart save following a sweetly struck free-kick. Jan Vertonghen was fantastic at the heart of the Spurs’ defence again as he kept his Belgian counterpart Divock Origi quiet at White Hart Lane. The Premier League’s joint-best defence have been helped by the partnership formed by Vertonghen and Toby Alderweireld which has provided Spurs with a solid backline; something which the Lilywhites have been lacking in past seasons. Marcos Rojo shone in place of the injured Luke Shaw in the left-back position for the Red Devils. Although the Argentine was caught out a few times, something which could be due to an unfamiliar position, the 25 year old provided a perfect cross for Ander Herrera’s header which put United out of sight against the Toffees in 3-0 victory. Both Herrera and French team-mate Morgan Schneiderlin both impressed against Everton in the middle of the park but the Spaniard gets the nod after scoring the second goal of the game. Herrera headed past Tim Howard from Rojo’s stunning cross and was exceptional throughout the game. Newcastle finally got their first win of the season at home to Norwich in the 6-2 rout. 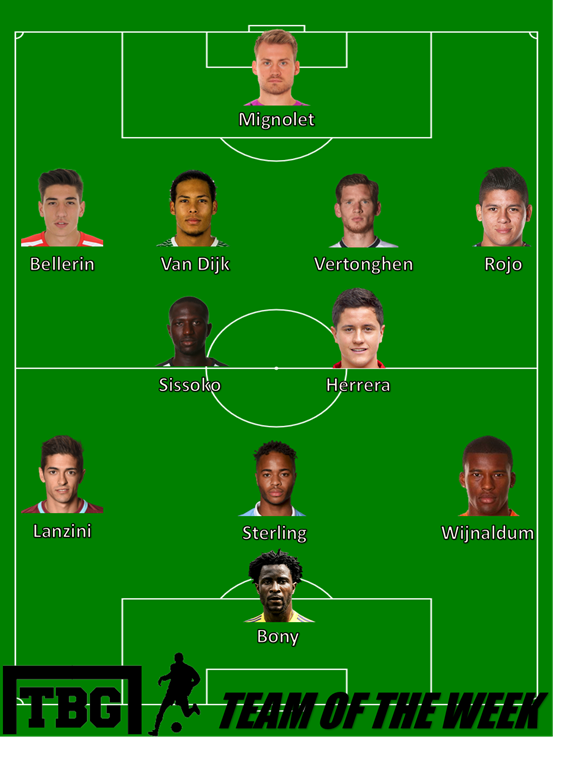 Sissoko takes his place in the team of the work after grabbing three assists at St James Park. Since his arrival at the club, the French powerhouse has became an increasingly influential figure on Tyneside and proved his worth yet again. Summer signing Georginio Wijnaldum was a no brainer after scoring four goals in the 6-2 victory for the Magpies; which also scoops him the star of the week award. The Dutchman has been Newcastle’s best player this season and his performance was perfect against the Canaries which earned Steven McClaren his first win as Newcastle boss. Raheem Sterling was instrumental in City’s demolition of Bournemouth and announced himself with a hat-trick against the Cherries. Sterling demonstrated the finishing quality that he has been criticised for in the past but probably should have scored two or three more as the former Liverpool forward excelled in the absence of David Silva. Hammers loanee Manuel Lanzini has impressed during his short stint at the Boleyn Ground and caught the eye again in the 3-1 win at Crystal Palace. Lanzini scored and assisted against Alan Pardew’s side and if he can continue his top form, his loan is likely to become a permanent transfer. The best player on the pitch at Selhurst Park and a superb signing by Slaven Bilic. Ivorian striker Wilfriend Bony stepped into Sergio Aguero’s shoes having not started a game since September 15. However, Bony linked up with Sterling effortlessly and grabbed himself two goals against Eddie Howe’s side; proving that he can be the man for Manuel Pellegrini’s side to lead the line in the upcoming Manchester derby.